My new Zerosum Oni 450 has changed my long standing rod action preference. It casts so beautifully I have become spoiled. I've come to realize that I prefer a softer action as opposed to the action of the stiffer rods I've been using for the past couple of years. Hence my new Suntech Kurenai HM39R. Wow!, what a rod. It's as light as a feather and casts beautifully with little effort on my part. Suntech has a winner with this rod. The fit, finish and design are typical Suntech quality, first class. 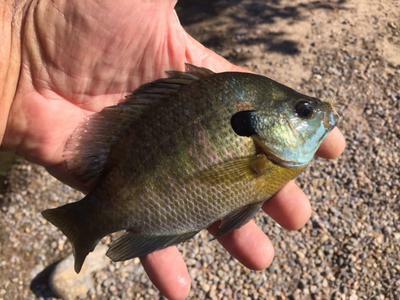 I took it out today for some bluegill action. I can hardly wait to try it out on some trout. The plastic rod cases Chris lists are another great piece of equipment. They're super light and adjustable length. I got the large one so I can carry several rods at a time. I've fitted it with a belt loop so it doubles as a holster. I just slip the rod I'm fishing with in it, fully extended for changing flies, tippet or whatever. No more laying the rod down or collapsing for any of these actions. Terry, it too have a couple of those cases but never thought of a belt loop/holster, great idea!! I sure agree with your assessment of the Suntech HM39R. For me, it is definitely in the category of, "If I could only own one rod....". As for sticking uncollapsed rods into your belt holster, I imagine that requires some mighty careful casting to avoid those 12-14 foot antennae. More importantly, walking upright under power lines might require some courage. Yet, the idea holds appeal. Bully for you --you have a very creative mind. I read the suggestion as being more of a third hand, temporarily holding the rod as you change a fly or unhook a fish. Pretty much the same thing I do by sliding the rod down my hippers to hold it, leaving my hands free. I can't imagine walking around like that. 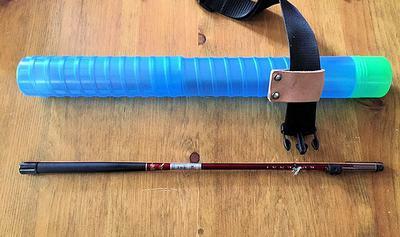 I have actually had two fully rigged rods, one in my right hand to cast with and the other in my left hipboot for a quick back to back how do these two rods compare kind of thing. For anything other than that it is asking for trouble (as is hooking a fish with the one you are casting!). Yeah, it is meant as a third hand helper. I wouldn't walk around with the rod extended in the holster. It's handy for changing flies, tippets, untangling wind knots and taking a photo. I ruined a good rod once laying it down and stepping on it. Lessons learned!